In recent years a variety of media outlets and healthy living advocates have shed light on the impact of gas emissions and possible carcinogen compounds produced by traditional grilling. While the research is still out on many of these topics, it has none the less driven a variety of grill manufacturers to produce alternatives. 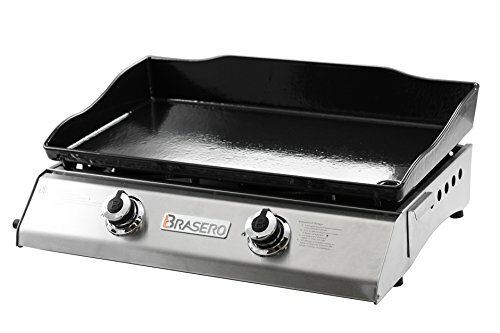 The Brasero 26-inch Portable gas griddle comes on strong in the category of portable outdoor griddles. It’s small enough to be taken with you on a camping trip or when you want to go tailgating. Yet is also big enough and durable enough to spend its life on your deck or patio. The body and burner elements are made from high-quality stainless steel. The griddle top itself is made from heavy duty cast iron that has been carefully coating in a durable layer of non-stick porcelain. It also includes a built-in ignition system to spare you having to meddle around with matches in the tight little space between the bottom of the griddle and burner element. The griddle top is also slanted to move grease and rendered fat away from the food while you cook. This helps to maintain its flavor, while also reducing the overall fat content of the meal. You can alter the angle by making small adjustments in the height of the legs. The Brasero 26-inch Gas Griddle also comes with a custom vinyl cover to keep the griddle surface clean of dust and other airborne particles, while not in use. Durability and quality are the page turning mark for portable gas griddles in this price range. Brasero does a very good job of making sure they are investing in quality materials and components without cutting corners. Yet the price point remains very friendly for its size. 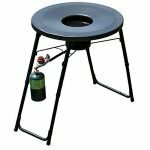 The stainless steel body and propane element are a step above what you find with many of the competitors. Most other griddles in this class will either use sheet aluminum with braces, or steel that is treated with a light layer of black powder coat. 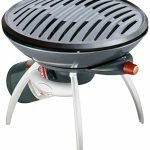 It’s also worth noting that the 26-inch Brasero comes with an adaptor, which allows you to connect to a larger propane tank or a propane hookup. A lot of other competitors in this range only come with the hook up for a 1-pound propane tank, and if you want the adaptor and hose you have to buy them separately. The weight of the Brasero sort of rides the line between a portable or a stationary grill. It rings in a little over forty pounds, which doesn’t count the propane tank. There are some online retailers who offer an expert assembly service. However, the Brasero is easy enough to put together that you don’t really need it. With some basic tools and a little mechanical sympathy, you should be able to fully put it together in under an hour. The Brascero’s propane burner produces up to 10,000 BTUs. This heat is then distributed to the heavy-duty cast iron griddle. Given ten to twelve minutes the griddle surface can get up to an impressive 600 degrees Fahrenheit! This is more than hot enough to develop a flavorful sear and crust on a steak, hamburger patties, or bratwursts. Yet it can also be dialed down to a more modest temperature range to do things like prepare breakfast or bacon and eggs. It can also make a very flavorful French toast with a crispy exterior and perfectly creamy, custard interior. The angle of the griddle top can be a little bit of an issue, but it’s easily adjustable. If you want to render out some of the excess fat from your hamburgers, you can leave it as it is. This will allow grease to gradually drain away into the large and easy to dispose-of drippings cup. If you want to make eggs over easy, you can simply adjust the feet of the grill to a more level profile to keep from having to chase the egg whites around with a spatula. When it comes to doing things like melting cheese. You might want to keep a little dome or lid nearby along with a small squirt bottle. You can then fill the bottle with a little broth, or some lightly salted water. Place the dome over the hamburger patty, along with some cheese. Then squirt a tiny amount of water onto the griddle surface next to the dome. The steam trapped inside will melt the cheese quickly without drying it out. The 26-inch by 9-inch griddle top provides you with 234 square inches of cooking space. This is enough space to prepare breakfast for a family of four, or grill four to five hamburger patties. The built-in igniter is a nice touch and spares you having to wiggle a stick lighter into the small space between the griddle and the stainless steel frame. The Brasero is set up with a slight slant to redirect grease to the drippings cup. Since it isn’t cold rolled steel it doesn’t need to have a protective seasoning layer, which spares you a lot of maintenance. You just need to gently scrape any grease and debris into the port, where it drains down into the drippings cup. A wet, soapy sponge can then wash down the griddle top to make sure all lingering traces of grease have been washed away. You can then store it with the custom vinyl cover to protect it from collecting dust and debris when not in use. The 26-inch Brasero comes with a limited lifetime warranty. However, this assumes that the product is registered, and the griddle is used and maintained properly. There is a bit of fine print to read through, which could void this warranty. So, take it with a grain of salt. 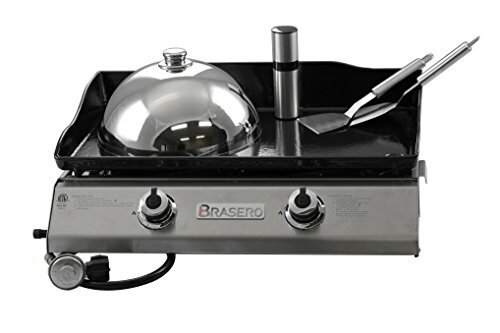 If you are looking for a quality portable, outdoor, gas griddle, the Brasero should be on your list. It’s got a lot to like. It could be a little bigger, and at 40-pounds it might make you break a sweat while taking it from Point A to Point B. Still, you get a lot of what you want for a friendly price point.